You are creating a gif animation manually from scratch. You are making an animated gif manually image by image, as opposed to screen recording. You want to add an introductory text. 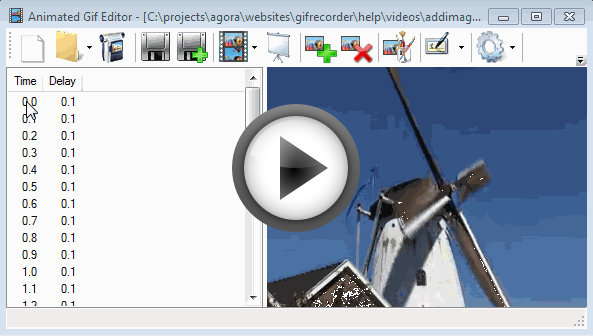 Add Image can also be used to Import an animated gif as a way of chaining films together. If an image is too large to fit in the animated gifs, it is automatically resized to fit. The image(s) are inserted after the previously selected image frame. The new inserted image is selected. After the insertion you can change the Delay time, for example give the image with Stop icon 5 seconds to give the user time to realize he can stop the animated gif by clicking.